The Golden Globes have always been one of my favorite award shows, so it works out perfectly that it's also one of the earliest each year. What better way to kick off a new year than watching your favorite celebs get dressed up and win awards? The 2016 Golden Globes air Sunday, Jan.10, and if it looks like everyone's having fun from your couch, that's because they totally are. There's food, entertainment, and yep — there's even booze. And if you're wondering what the stars drink at the Golden Globes, prepare yourself, because the options at the ceremony are unreal. First of all, the night starts off with a meal — before broadcasting, of course. According to People, last year's menu included a salad, filet mignon, and a potato croquette, which sounds super delicious. And thanks to Yahoo!, we already know this year's menu includes a surf and turf option, too. But no matter how good the show is, you won't see forks and knives moving on screen. The plates are cleared before the show starts... probably to avoid any awkward moments of catching celebrities off-guard when they've just taken a mouthful of steak. Plus, it ensures that no one will be hungrily sitting in thier seats, just waiting for the show to be over so they can get something to eat. But enough about dinner. Let's talk about the alcohol, of which there is plenty. And if you like champagne, prepare to be jealous. The fun starts on the red carpet, where according to Yahoo!, more than 1,500 mini bottles of Moët Imperial will be served, plus 125 cases of the brand's Brut and Rosé with dinner. Oh, and guests will be drinking a signature champagne cocktail throughout the show. With 1,300 guests in attendance, nominees should just be careful not to miss their category while they're in line for the bar. If you're feeling bummed out that you won't be in attendance to enjoy all this good stuff, don't worry. 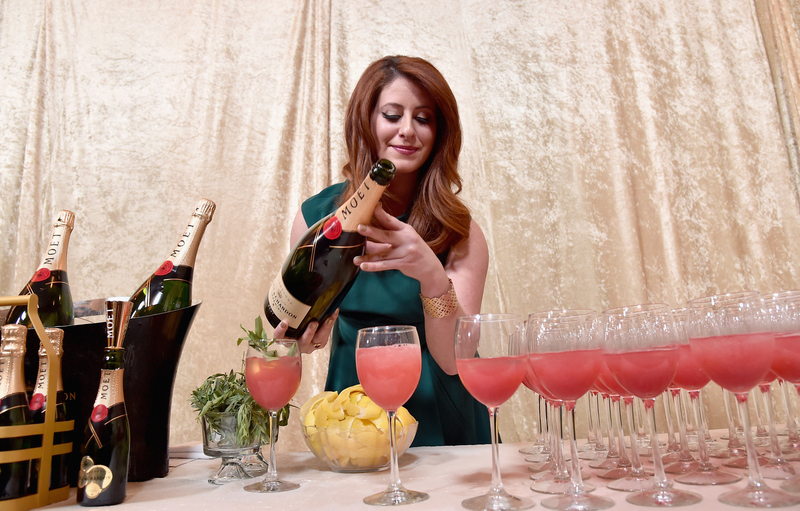 You can drink along with the show, because mixologist Karen Grill has already released the cocktail recipes she created especially for the Golden Globes. One of them is called a Moët Ruby Red and involves Moët champagne (obviously), vodka, raspberry, and lemon juice, which means I'm already on board. Yum! Forget about making that drink at home, though. Next year, I need to find a way into this ceremony for the dining and drinking experience alone. Any celebs out there looking for a date?